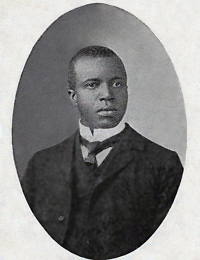 Scott Joplin, known popularly as the "King of Ragtime". He wrote 44 ragtime pieces, one ragtime ballet and two operas. His "Maple Leaf Rag" (1899) was was perhaps the most influential rag ever written. Other piano music by Joplin included the following rags: "The Easy Winners", "Elite Syncopations", "The Entertainer". "The Cascades", "Leola", "Gladiolus Rag", "Search-Light Rag", Fig Leaf Rag", "Sugar Cane", "Euphonic Sounds", "Paragon Rag", "Wall Street Rag", and "Magnetic Rag". He also composed "Bethena, waltz for piano" and "Solace, mexican serenade for piano". Sadly, his two operas, "A Guest of Honor" and "Treemonisha", were not well received in his lifetime. Scott Jopline photo taken in 1907. 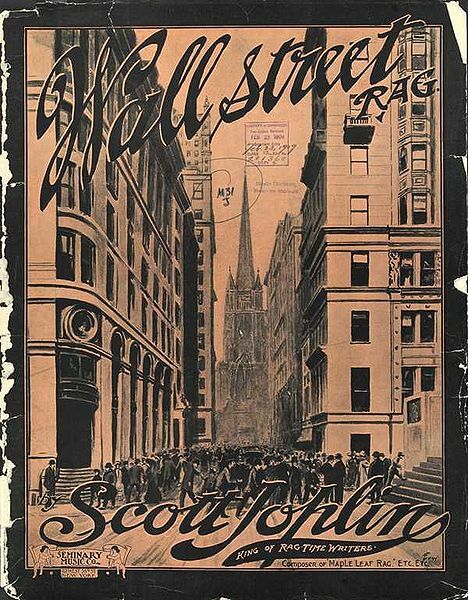 Sheet music cover of "Wall Street Rag", by Scott Joplin (1909). Copy of sheet music for "Maple Leaf Rag". Written by Scott Joplin, published by John Stark in 1899. 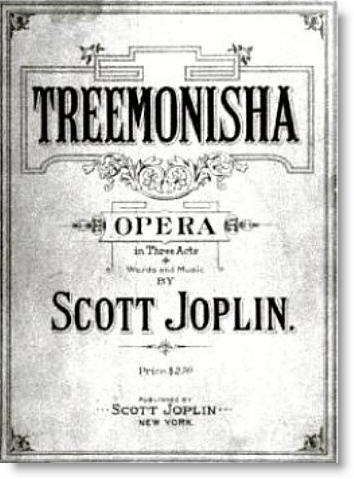 Cover of sheet music for the opera "Treemonisha" by Scott Joplin. This was self-published in New York City in 1911 by Scott Joplin. Note: This picture gallery page includes drawings, paintings, photos and images of performances of aaaaaa.